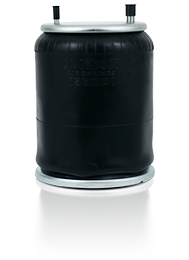 Complete air springs are suspension elements that are developed for trucks, towing vehicles and trailer group heavy vehicles; they help the driver and the load get minimally effected by adverse conditions on the road, preserve the vehicle balance during loading conditions, and keep the road, product and passenger safeties at utmost levels through a balanced drive. Complete air springs offer ease of use for trailer and truck type vehicles through functions like independent movement capability and variable height adjustment to meet application requirements during loading and unloading. Through balanced load distribution between axles and preservation of center of mass, degradation of highways is minimized and long-term road maintenance costs are minimized. Nominal working ranges, natural frequency values and load capacities for the products vary with location of use.